Humanity on the Brink in Ben Bova’s “New Earth” | J.W. Wartick -"Always Have a Reason"
Ben Bova’s New Earth is a spectacular novel that mixes hard sci fi with a touch of space opera. I recently investigated a major theme of the novel: the notion that we may find hope in the stars. Here, we’ll explore some other major themes of the book, including exploration, the possibility of human extinction, and xenophobia. There will be major SPOILERS in what follows. “It’s a big universe,” said Stavenger. There is some debate now over funding for NASA, for example. What good does it do to send people to the moon? Surely that funding could be better spent on, say, relieving world hunger. In fact, this exact argument is made within New Earth, because the planet Earth is itself suffering from catastrophes caused by global warming, among other issues. Yet Bova, through Stavenger, makes an argument for exploration: the drive to explore, the imagination; these are things which drive invention and innovation. As Stavenger put it, the drive to explore leads to new wealth and new technology for everyone. It is interesting to see this debate play out in fiction, though this was largely where it dropped… However, one could argue that the ultimate revelation, that humanity was truly on the brink of destruction from the coming apocalypse from a local star, is itself an argument for the success of the project of human exploration. Our home planet is in serious trouble in the time of New Earth. Global warming has devastated the environment, causing flooding across coastal regions, precipitation cycles to reorient and move. Drought and inundations of rain alternatively destroy their respective climate zones. Humanity flees the shorelines. Through this bleak look into humanity’s plight, Bova issues a call for humans now to work against environmental catastrophe. Of course, some dispute the trend towards global warming, but even if global warming is some sort of myth, it seems to me that we must work toward caring for creation in such a way that we minimize our destruction of ecological systems. We are God’s stewards on Earth and so we should work to take care of the gifts of God’s creation. Of course, in New Earth the consequences of forsaking this gift of God–our charge to care for the Earth–are put into fictional perspective. The destruction to the planet leads to destruction of human life. The resistance the human characters have in New Earth to the information presented to them by the “humans” on New Earth is interesting and, in my opinion, helps to characterize the reality of human nature. Many of the humans on the excursion to New Earth are deeply suspicious of the alien life they have found. Moreover, the way they react to the friendliness of the aliens reflects a culture that the aliens (and the sentient machine) view as deeply barbaric. The human tendency to be distrustful, it is said, is due to their evolutionary history and the way that such distrust helped survival. However, I think this same portrayal has theological significance. Humanity is fallen, and our past is littered with the results of our fallen nature. It is not at all hard to imagine humans reacting just as those did in New Earth. The reality of human nature is such that one cannot but think that no matter how tactfully and amiably such aliens approached us, the reaction would probably be negative. To trust the aliens to tell us about a coming destruction for which we should prepare to survive is to take it to another level. 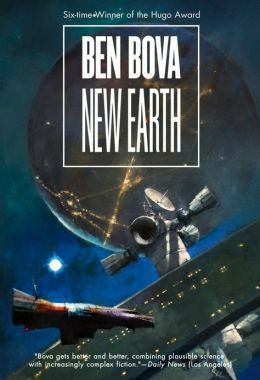 Bova’s work New Earth is one of my favorites from one of the masters of science fiction. I’ve already discussed how it explored the issue of hope from the heavens in materialistic literature. Now, we’ve seen how it explores other issues which are both current and historic. Let me know what you think of the themes brought up in the book! Caring for Creation: A discussion among evangelicals– I write about creation care from a number of perspectives offered at a recent panel of prominent evangelical thinkers in this area. Book Review: “For the Beauty of the Earth” by Steven Bouma-Prediger– Several issues related to the environment and Christian theology are drawn out in this extremely interesting book. Haven’t read you review — heeding the spoiler warning — but thanks for bringing this book to our attention. Just your lead paragraph makes me think I’d find it interesting. Happy Thanksgiving!